Thanks for this cool suggestion. I’m working on a life coaching book and right now I use a giant whiteboard and sticky notes. I love it at some level, but I think adding a computerized system would take it to the next level. Thanks for your comment. Although Write It Now 4 is more geared to fiction, tt sounds like this program may be what you need to help organize all those sticky notes. 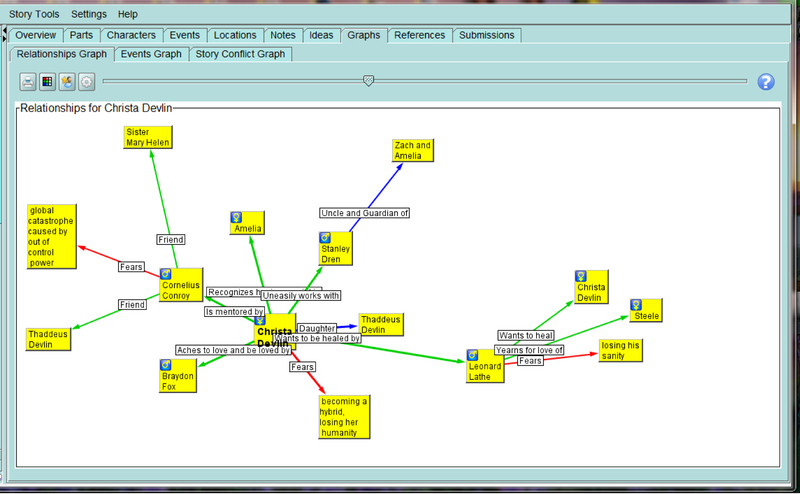 If anyone out there has used a writing software program for non-fiction, please let us know. Life coaching is such an important pursuit. That looks pretty darn cool. I’m dying to try one of these programs out (I know Scrivener has a 30-day trial), though have been told to perhaps wait until the next manuscript as it can be hard to import while midway through a WIP. In the meantime, I’ll add your application to my evaluation list. I’m glad it helps, Laura. I got Write It Now 4 about a third of the way through my WIP, and remember it being easy to import from Word and organize. It does take some time to create the character profiles, and to organize the storyboard, but I am constantly referring to and updating both as move ahead. I’ve heard great things about Scrivener, too. I got Scrivener on the advice of good friends Stephen Woodfin and Caleb Pirtle – I have an idea there’s not a lot difference in what they’ll do – I’m just glad they recommended it. I’ve been doing things the really hard way. I’m almost half way through my current novel and I didn’t have any problem importing the project. In fact, I’m about to import all of my blog files – I need organizational help there as much as I need it anywhere. Thanks for the comment, Bert. I hadn’t thought about using it for blog files. I’d be interested to hear how that works for you. It makes me wonder if these writing software programs could be applied to marketing plans, too. I use OneNote, that came in the Microsoft Office package. Hello Rita, Scrivener and Write It Now 4 are similar programs. I get the impression that more writers use Scrivener because Scrivener had better marketing outreach, so if you’re looking for help, it may be easier to find a fellow writer who uses Scrivener. I chose Write It Now 4 because it had a few more features that I knew I would use. Either program will work well for your novel. I think it’s great that you’re writing non-fiction and want to write a novel. I was a travel writer for many years, but I was always a novelist at heart. Thanks so much for adding this informative comment to this discussion. I really appreciate your taking the time to help our fellow writers. After using a writing software program for many months, I highly recommend that all novelists invest in one of these programs. I’ve had good luck with Write It Now 4, but I have heard all positive reviews from writers who use Scrivener. Now I am beginning to look into the editing software that’s out there. I hope to post thoughts on that, too. Like you I was fumbling in the dark with Word. I’d never finished anything beyond a couple of shirt stories. I bought Scrivener for £30 and 12 weeks later I’d finished a 40,000 word novella that I’m publishing after Christmas. Writing or content generation software is as useful to writers as a drill is to a dentist. It allows you to cut away the crap, isolate the core and make it better. Congratulations on your exciting news. Thanks for sharing this success story. A week ago, after receiving the comment from Sprocket, below, I looked again at Scrivener and bought it. I am using Scrivener now instead of Write It Now 4. Both programs have their advantages, but when you’re well into your first draft, Scrivener is the better program. Write It Now 4’s character diagrams were very helpful in the planning stages of my novel, however. I plan to update this post with my thoughts on Scrivener, but, in the meanwhile, I agree completely with you. Every writer should have a writing software program. As for editing software, I’m looking into Autocrit and SmartEdit. I haven’t had a chance to use either one enough to write a post on it. Any information you’d like to share is most welcome. I have been searching the web for a writing program with great reviews. Write It Now seems to be right up my alley. It is very similar to Page Four, but with more neat area to play in and expand your stories elements. Then there is the Writers Blocks, another writing program that had me salivating, as it used the Story Board process of writing. Linear thinkers breathed a great sigh of joy in unison when this came to being. So which program was better? After downloading trial versions and playing with them a bit, imagine my surprise to discover that Write It Now 4’s version now had a Story Board. Wow! The best of both worlds. Now I only have one more question before I make that final step in purchasing…does Write It Now allow the use of Dragon Naturally Speaking? Does anyone know? Thanks for sharing, Robyn. Great information. I don’t know about Dragon Naturally Speaking. Can anyone out there help with that one? I plan to update my reviews of Write It Now 4 versus Scrivener. Until I find the time to write a complete post, the short version is that now I’ve used both programs. I prefer Write It Now 4 when planning and beginning a novel. I like WIN4’s storyboard set-up, character generator and character dynamics diagrams. However, when I was well into the first draft, and now that I am starting to revise, I prefer Scrivener. I like how you can easily split pages, or see only the chapters from a particular character’s point of view in Scrivener. I also like the autosave better on Scrivener and its compile feature. So, although it seems redundant to have two writing software programs, I think it is worth it to invest in Write It Now 4 for the planning and beginning stages of a novel, and Scrivener for getting deeper into the first draft and for revisions. Either, or both, will definitely improve and help your writing. More later. Hi Robyn. This has been really useful — thanks for sharing your insights. I was recently injured in an automobile accident so I’ll have several (many?) months available to start that novel I’ve been meaning to write. But sitting-up and typing are pretty much out of the question. So I’ve decided to try to combine Dragon Naturally Speaking with WIN. I’m keenly interested in knowing if anyone got back to you on the compatibility question. Thanks. Richard, I’m sorry to hear about your accident, but I love your positive attitude. I tried to do some research on Dragon Naturally Speaking and its potential compatibility with WIN. I’ve not used DNS, but I see from professional and user reviews that it is compatible with Microsoft Word. Microsoft Word can be copied and pasted into WIN. That said, I came across several people who use DNS with Scrivener. One said: I can do almost anything I need to do using Dragon NaturallySpeaking. It’s closely integrated with your browser, so it can be used in WordPress. In addition, it will type into just about any program you care to name. I use it in TweetDeck, EverNote, Scrivener, OpenOffice, and HTML Kit. Not all functions work in all of those programs, but basic dictation always does. In addition, I can use DragonPad (part of the program) to create whatever document I wish, and then I can copy and paste into the target program if I want to have all the features of Dragon NaturallySpeaking available to me. Switching from one program to another program can be accomplished with one spoken command (three words – “switch to nameofprogram”.) See more at http://www.lizandrashaw.com/2012/04/i-talk-it-types/. A Mac user said: Just a friendly comment that I’m also using Scrivener with Dragon and have discovered that you can speak directly into Scrivener. I just remove the little box that pops up is the first time Dragon starts and select the Scrivener input box instead. Also, DNS is on sale today at Amazon for $55.88; http://www.amazon.com/Dragon-NaturallySpeaking-Home-12-0-English/dp/B008MR36FE/ref=sr_1_1?s=software&ie=UTF8&qid=1365433821&sr=1-1&keywords=dragon+naturally+speaking. I hope this helps. Does anyone else out there have an insight into this? My comment below should be addressed to Pamela as well as Robyn. Sorry – “working” with an iPhone is a little challenging. Ergo the need for Dragon. I use Write It Now with Dragon Naturally Speaking all the time. But then, I use Dragon more for the writing aspect and not the command aspect (meaning I dictate, write, transcribe — into files or into Dragon pad — but don’t really move files o r redistribute info from place to place. For that I just use traditional drop down menus in Windows.) Hope that helps. Thanks, Lee. I know other writers who use Dragon Naturally Speaking. I’ve pretty much converted to Scrivener at this point, but I find that converting my Scrivener work into Word gives me a new perspective on the manuscript. What works for me now is creating the draft in a writing software program like Scrivener, then converting it to Word in segments as I’m working on them, and printing those segments to read through them. I think taking different approaches, as in using programs like Dragon, always is helpful in lending new perspectives and improving the writing. Thanks for sharing, Nancy. Losing work is a writer’s worst nightmare. This week, my computer crashed. I am now owner of a new computer and I’m pleased to report that Scrivener made it very easy for me to download Scrivener without paying for it again. Thank you, Scrivener. And I was able to transfer my manuscript onto the new computer in Scrivener. I thought I was “backing up” my work by compiling my Scrivener ms into a Word doc, then emailing the doc to myself. It turns out that my server does not save emails that I’ve downloaded to my PC (this is another story). It worked out okay in the end, but I’m going to be much more vigilant about copying my work onto my external hard drive or saving it in online storage, which has the added advantage of being accessible on other devices (if I ever get a smartphone). I’m sorry to hear that WIN4 is giving you this terrible trouble and was not responsive to your trouble. Anyone else have this problem? And have a solution? I just bought Write it Now. In general I think it is great, but there are a couple concerns. Why doesn’t it keep track of the relationships. Such as, Michael is the father of Sharon, then I have to tell it that Sharon is the daughter of Michael. Then when doing a character graph it shows Sharon as 2 separate people, the daughter of Michael and Michael the father of Sharon. Am I missing something? Also highlighting text in notes would be nice. WriteItNow will create reciprocal relationships. The option is a little hard to find. If you’ve said that “Michael is the father of Sharon” it’ll add “Sharon is the daughter of Michael”. Thanks for this tip. I’m finishing my “final run-through” of my latest thriller. I have converted the Scrivener ms into a Word document for this phase. I’ll be starting my next thriller soon, and plan to use WriteItNow for the planning process, then Scrivener for the writing, then most likely Word for the polishing. Is this crazy? I’ll keep you all posted as it progresses. In any case, I am recommending Scrivener to every writer I know as that is the program I used most. Does anyone know how much storage space is required for the Windows edition? I own both Scrivener and WriteItNow4 but, after attempting to stay awake five times through “the demo that never ends” for Scrivener I opted to work in WriteItNow. In fact, I might even suggest that the lack of instruction supplied with WriteItNow is what makes it so productive, the program is intuitive enough that you can bumble your way through with ease 🙂 One major drawback for Scrivener (besides the endless talking head instruction video) is that it doesn’t have a timeline function. A lot of my Scrivenering friends are now eyeing WriteItNow for that very reason. Great information, Anna. Thanks. I’m using Scrivener exclusively now that I am deep into my “final” revision of my thriller novel. I wish I could give a definitive answer to which program is best, Scrivener or WriteItNow4, but both programs have the pros and cons. What I can say definitively is that every writer should have one of these programs. It is absolutely worth the $40 to $70 (depending on software and current pricing). The programs organize chapters, notes, ideas, backstory details, etc. so that you can free your time and energy for your creativity. Right now, I’d vote for Scrivener, because it is ideal in the revision process. But, when I begin my next novel, I will likely use WriteItNow4 to start up the project, as I like how it lays out character dynamics and research notes and, as you noted, the timeline. Then I can convert into Scrivener when I’m deeper into the writing process. Also, as you noted, it’s always better to spend more time writing and less time learning how to use software. Good luck! Thanks for all your comments. I have learned much today. I use WriteItNow religiously, and it works wonders for me. As a creative writer of horror fiction, I find that WIN5 is pretty much Scrivener without all the bloat, bloat of which I will never use… Don’t get me wrong, Scrivener is fantastic, but WIN5 is that much more fantastic for novelist and author’s alike. Thanks for letting fellow writers know about your use of WriteItNow. It’s very helpful to learn about what works best for your writing. 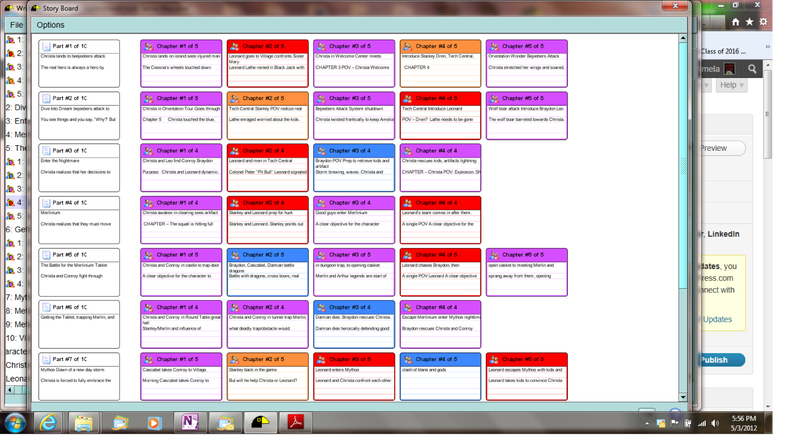 I’m using Scrivener now for my thriller-in-progress. I love how I can work on scenes individually, and see the overall structure of the novel on the bulletin board. I’ve also set up bulletin boards for Characters and Settings, which are very useful for my personal reference. You’re right, though, I probably don’t use much of Scrivener’s many offerings. It sounds like WIN5 is better streamlined. BTW, great to connect with a horror writer!